Even buy-and-hold investors can't afford to let their portfolios collect cobwebs. Valuations and fundamentals change perpetually, and shareholders need to know what they're holding -- and if there's more potential for growth elsewhere. Here we take a look at stocks worth swapping. Given the way H&R Block (HRB) has bought and sold assets over the years, I'm guessing that its tax attorneys prefer getting paid by the hour. The tax prep giant's latest move came earlier this week, unloading accounting consultancy RSM McGladrey in a $610 million deal. I don't have a firm conviction on the deal one way or the other, but it does remind me that H&R Block is the kind of company that will fade in relevance over time. I'm not suggesting the government will ever succeed in simplifying the tax code to the point where individuals and corporations don't need H&R Block's flagship tax-filing services; rather, it's the ease of cheap software, and now the cost effectiveness of free Web-based platforms, that makes it less likely you'll be heading into an H&R Block office next April. Yes, H&R Block is all over the software and online filing trends, but it won't be able to grow the way it used to in these areas. H&R Block is already starting to be a disappointment, having missed Wall Street's bottom-line estimates in each of its two past quarters. Good luck heading into next week's telltale quarterly report with that kind of negative momentum. The more nimble Intuit (INTU), on the other hand, has been a beast. It's been years since the accounting software giant hasn't been able to meet or beat analyst profit forecasts. Maybe it's just me, but I like to go with the bean counters that do the better job of guiding Wall Street expectations. Intuit also hasn't followed H&R Block into the ill-advised subprime mortgage market that it bowed out of in 2007, or the embarrassment of underestimating its own state income tax liability the year before that. 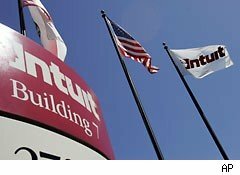 Intuit sticks to its knitting, which is primarily its QuickBooks accounting program for small businesses and a few other logically related services. What's Your Preference: Growth or Value? Value investors will gravitate to H&R Block. The company's juicy 4.5% dividend is nearly three times what Intuit is yielding. H&R Block is also trading at just nine times the $1.63 a share that analysts see it earning in fiscal 2012. Intuit trades at a richer earnings multiple of 15 times the $2.95 a share that the pros are projecting for its new fiscal year. However, Intuit is also growing a lot faster. The 9% top-line growth that Wall Street is targeting for the year ahead is easier to digest than the flattish 2% uptick they see for H&R Block. Income investors may still decide to go for the chunky yield, but how sustainable will that dividend be if H&R Block stumbles again or runs out of assets to sell at its garage sale?